This card gains 300 ATK for every “Dark Magician” or “Magician of Black Chaos” in either player’s Graveyard. The prettiest card that was never good enough. Dark Magician Girl is exactly like Dark Magician in that she is a mascot of the game; however, while her master has received legitimate support, Dark Magician Girl has been left far behind and still has no business being played competitively. In fact, I would wager that there isn’t a card in the game that has received as much specific support but is still so utterly useless. It’s sad really. I think we’d all like to have this pretty gal in our decks. But the fact of the matter is that Konami focused on Dark Magician and threw scraps and artwork at his apprentice. She’s featured on many of the new Dark Magician cards, but even her Timaeus fusions aren’t good enough to warrant a tech play, especially now. If you have Timaeus, you’re no longer wasting it on anything except Dark Magician the Dragon Knight. And now that we have Apprentice Illusion Magician, there’s even less reason to add more tribute monsters into the lineup. I find myself wishing that Apprentice Illusion Magician looked more like Dark Magician Girl so I could better convince myself it is her, but even with the same stats, they don’t really look a lot alike. Her future potential isn’t horrible, though. For as much as she’s gotten the shaft, the fact is Dark Magician Girl certainly has never been forgotten. As I said previously, she gets a lot of new support still. And the day could very well come that new Dark Magician support that also refers to her could be good enough to warrant her inclusion. In fact, I wouldn’t bet against it happening. Everyone loves Dark Magician Girl! We just shouldn’t be playing her right now. You probably know how I feel about this by now, but I think adding waifu anime girls to Yugioh cards has cheapened the brand. The card has average stats and an abysmal effect to further emphasize that its just a collectors item. You would need to have 2 copies of a specific LV7 vanilla monster in the graveyard (without them clogging your hand) just to this make this card slightly better than Summoned Skull. If she is ever viable, it would only be because she’s a LV6 DARK Spellcaster. I’ll re-create the card for fun. When “Dark Magician” is face-up on your side of the field, you can Special Summon this card from your hand during your Main Phase or opponent’s Battle Phase. Once, while this card is face-up, if Dark Magician is sent to the graveyard while this card is face-up, you can Special Summon it to your side of the field in face-up Defense Position. 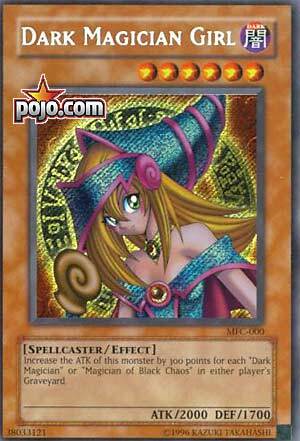 Dark Magician Girl, or DMG for short, was one of the most desired card in all of Yu-Gi-Oh when it came out. The artwork, the iconic status in the anime, this card was highly desired despite its lack of playability. 2000 base ATK isn’t good for a Level 6 monster. She’s got the support behind her, but the 300ATK boost only works if you play her with Dark Magician. Now with the release of Apprentice Illusion Magician, DMG may never see play again. It’s a shame, but most of the time you’ll have a 2000-2300ATK DMG that will cost you a monster on the field. Apprentice Illusion Magician can be Special Summoned by discarding a card, gives you a DM search, and is a Kalut when a DARK Spellcaster attacks a monster. Will always have love for DMG, but her playability isn’t really there anymore. Even with all the cards they finally released that revolve around her. Maybe in a fun deck dedicated to her and Dark Magician. Dark Magician Girl has been outclassed even in her own Dark Magician Girl deck. She’s unnecessary anywhere else and she has been replaced by an alternate effect with the same stats. Most old monsters have been upgraded to where the original is not needed just like almost everything else from the original set. Use it as a token. Ah, good ok Dark Magician Girl. One of the most iconic monsters in the game. I will say, she is beautiful. Anyways, she gains 300 ATK for every Dark Magician or Magician of Black Chaos in either GY. Boosting stats is cool, but kinda weak in 2017 if that is the only effect you have, especially if it is pretty situational, requiring two very specific monsters. However, what this card does doesn’t really matter. The card is still awesome. 5/5 for the nostalsgia value that this card will always have. How appropriate in this week that Dark Magician Girl gets the throwback slot, no? As referenced earlier this week, she is rather outclassed now, by a card we reviewed earlier this week. The original, who is the cutest card in the game, she does get the marginal 300 powerup per DM or Magician of Black Chaos in either Graveyard. She does have a few tricks and plenty of her own support, so I honestly can’t fault anyone playing DM for using one of her (if even just based on her art). Next articleNew Pokémon Ultra Sun And Pokémon Ultra Moon Details Revealed!